The Sixty-fourth United States Congress was a meeting of the legislative branch of the United States federal government, composed of the United States Senate and the United States House of Representatives. It met in Washington, DC from March 4, 1915, to March 4, 1917, during the third and fourth years of Woodrow Wilson's presidency. The apportionment of seats in the House of Representatives was based on the Thirteenth Census of the United States in 1910. Both chambers had a Democratic majority. President Wilson before Congress, announcing the break in the official relations with Germany. February 3, 1917. June 9, 1915: (Prelude to World War I):U.S. Secretary of State William Jennings Bryan resigned over a disagreement regarding the nation's handling of the RMS Lusitania sinking. July 24, 1915: The steamer SS Eastland capsized in central Chicago, with the loss of 844 lives. July 28, 1915: The United States occupation of Haiti began. August 5–August 23, 1915: Hurricane Two of the 1915 Atlantic hurricane season over Galveston and New Orleans left 275 dead. March 8–March 9, 1916: Mexican Revolution: Pancho Villa led about 500 Mexican raiders in an attack against Columbus, New Mexico, killing 12 U.S. soldiers. A garrison of the U.S. 13th Cavalry Regiment fights back and drives them away. March 15, 1916: President Woodrow Wilson sent 12,000 United States troops over the U.S.-Mexico border to pursue Pancho Villa. May 5, 1916: United States Marines invaded the Dominican Republic. July 30, 1916: German agents caused the Black Tom explosion in Jersey City, New Jersey, an act of sabotage destroying an ammunition depot and killing at least 7 people. November 7, 1916: U.S. presidential election, 1916: Democratic President Woodrow Wilson narrowly defeated Republican Charles E. Hughes. January 11, 1917: (Prelude to World War I): German saboteurs set off the Kingsland Explosion at Kingsland, NJ (now Lyndhurst, NJ), one of the events leading to U.S. involvement in World War I.
January 17, 1917: Treaty of the Danish West Indies signed by President Wilson, ceding the Danish West Indies to the United States after their purchase from Denmark, and renaming them the US Virgin Islands. Map showing Senate party membership at the start of the 64th Congress. Red states are represented by two Republicans and blue by two Democrats. Purple states are represented by one senator from each party. 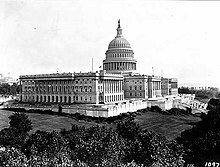 Presidents pro tempore: James P. Clarke and Willard Saulsbury, Jr.
Republican Conference Secretary: James Wolcott Wadsworth Jr.
At this time, most sitting Senators had been elected by the state legislatures, with one-third beginning new six-year terms with each Congress. Due to the 17th Amendment, the incoming class of senators from the 1914 election were all elected directly by the residents of their state, In this Congress, Class 1 meant their term ended with this Congress, requiring reelection in 1916; Class 2 meant their term began in the last Congress, requiring reelection in 1918; and Class 3 meant their term began in this Congress, requiring reelection in 1920. Georgia 8th Samuel J. Tribble (D) Incumbent died December 8, 1916. South Carolina 5th David E. Finley (D) Resigned January 26, 1917. U.S. Congress (2005). "Biographical Directory of the U.S. Congress". Archived from the original on 1 June 2006. Retrieved 2006-06-01. U.S. House of Representatives (2006). "Congressional History". Archived from the original on 1 June 2006. Retrieved 2006-06-01. U.S. Senate (2006). "Statistics and Lists". Archived from the original on 1 June 2006. Retrieved 2006-06-01. Official Congressional Directory for the 64th Congress, 1st Session. Official Congressional Directory for the 64th Congress, 1st Session (1st Revision). Official Congressional Directory for the 64th Congress, 1st Session (2nd Revision). Congress, United States (1916). Official Congressional Directory for the 64th Congress, 2nd Session. Official Congressional Directory for the 64th Congress, 2nd Session (Revision). This page was last edited on 25 August 2018, at 21:50 (UTC).